Who knew that watermelon and cucumber would work so well together in a salad? I really liked how refreshing this combination is. The additional feta cheese added some creamy tang while the lime juice gave the salad just a tiny bit of tartness. It all worked so well together that I plan on preparing this salad for summers going forward. It's also a great way to use up leftover watermelon and cucumbers that you may have sitting around too! 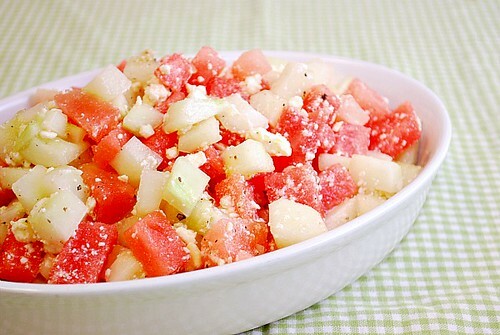 In a large bowl, toss cucumber and watermelon with lime juice, olive oil, 3/4 teaspoon salt, and 1/8 teaspoon pepper. Crumble in feta cheese, toss and serve immediately. So simple but so delicious sounding, I actually have a watermelon in the fridge just waiting to be eaten. This might be my last summer recipe!